Ditch Your Sugar Habit, Finally! Most people typically don’t have a firm grasp of how much sugar we consume on a yearly basis unknowingly. It’s been said that the average person consumes more than 40 pounds of sugar in a calendar year — quite alarming when you think of it in pounds, right? When we think of sugar, sweet desserts such as cakes, donuts, candy, and cookies come to mind immediately. But there are tremendous amounts of sugar hiding in everyday things we consume, and when we consume them regularly, they add up fast. Choose real fruits. It takes no extra time to grab an apple rather than a pre-packaged fruit cup or applesauce. It’s just as easy and doesn’t contain any of the added sugar the pre-packaged items have. So, choose something fresh from the produce stand instead. *I keep a stock of fresh fruits on my kitchen island ready to grab! Focus on fiber and protein power. Fiber-rich foods will fill you up and keep you that way for longer so you’ll be less likely to eat something when you’re not hungry. Protein-packed foods have the same benefit. Combine both of these for delicious ways to stay satisfied throughout the day, and you’ll be less likely to seek out sugar. *try apple slices with almond butter or another nut butter for a yummy snack that tastes liek a treat. *I was surprised how much I enjoyed the “bulletproof” coffee that contains no sugar but was satisfying and filling. Go here for the recipe. Study labels before you buy. Is your pantry brimming with pre-packaged, processed foods? It’s time to learn to live without these. And when you do, commit to reading all the labels of every packaged food item you buy from now on. Added sugar is in some of the most unsuspecting places so read every label before putting anything into your grocery cart. As part of my coaching programs, I offer grocery shopping tours as well as pantry makeovers to help you through the process of making healthier choices when shopping and meal planning. Interested? Schedule your makeover appointment with me HERE. Drown out cravings with water. If you’re a soda drinker, you can cut out quite a bit of added sugar by ditching your soda habit. I had a client quit her Dr. Pepper habit to drop 9lbs in less than 2 weeks! Sometimes, we think we’re hungry when we’re actually thirsty — and other times, a stressed day makes us reach for desserts. Whatever the case, a glass of water can solve the problem. Drink one down and then wait 15 to 20 minutes. The craving will usually be gone but if not, choose a piece of fruit to satisfy the urge. It takes time to get used to life without added sugar in it, but you’ll soon feel better than ever. Finding the perfect sweet treats that aren’t harmful to your health is a powerful way to get past the urges and learn to adapt to your new lifestyle without processed sugar. One of my favorite go-to sweets, especially in the evening time (which is when I seem to crave sweets) is sliced apple sprinkled with cinnamon, tastes like apple pie! 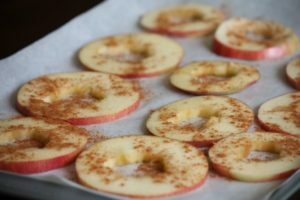 Try baking them at 200 degrees for 30-45 min or until dried for cinnamon apple slices!